Cut bread horizontally in half, then cut each piece crosswise in half. Place, cut sides up, on baking sheet. Spread with pizza sauce. Add desired pizza toppings; sprinkle with cheese. Bake 15 to 18 min. or until pizzas are heated through and cheese is melted. Prepare using CLASSICO Organic Marinara Pasta Sauce. 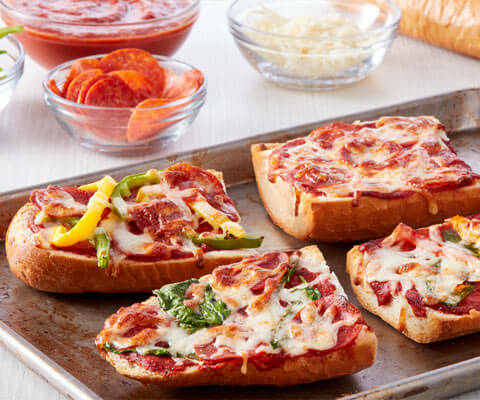 Substitute any other pizza toppings, such as cooked crumbled Italian sausage, chopped onions, sliced mushrooms and/or sliced black olives, for any of the suggested pizza toppings. I just added red pepper flakes. It was very good. Easy because you can use most anything you have on hand.